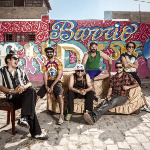 Since forming in 2003, Bareto have been boldly exploring the outer limits of Peruvian cumbia, playfully merging ska, son, merengue, rock and reggae elements alongside the classic guitar-driven chicha style. 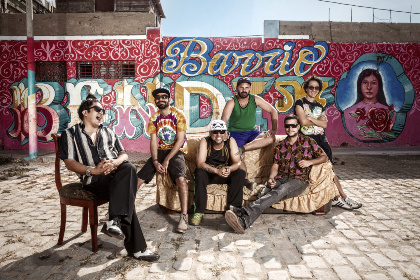 Chicha first appeared in the ‘60s as a mix of Andean huayno folk roots with Columbian cumbia, minus the accordions, plus electric surf guitar sounds and wheezing electric organs, creating a unique Latin psychedelic rock style which has enjoyed a revival over the last decade. Bareto were at the forefront of that revival but they haven’t stood still and their experimentalism has been rewarded with Gold Discs and Latin Grammy nominations. Their fifth album, Impredecible, mixed by Sidestepper’s Richard Blair, has been impressing international critics with its confident diversity, encompassing twangy surf guitar, shimmering dub, dreamy acoustica, Latin jazz and a guest appearance from Susana Baca.